Beautifully colored leathers require delicate handling during cleaning. The colors and emollients used at the factory are mixed and applied under strict guidelines in order to achieve repeatable results over hundreds of handbags. Coloration can depend on the type of leather, the desired finish, and fashion. There are "hard" leathers and "soft" leathers. Each type requires a different type of coloring agent - and different care methods. 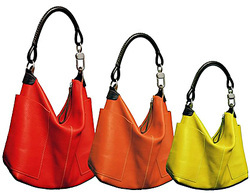 When brightly colored leather handbags are subjected to the natural wear and elements, there may be a color change due to moisture or mildew. In severe cases, especially with hard leather, the leather may crack because of moisture exposure. A reputable leather cleaner may be able to achieve an acceptable level of restoration in a cracked leather handbag, but it is best to discuss this and to get an estimate for the work. A leather cleaner with superior knowledge will examine the handbag to determine whether or not the leather has been subjected to stretching or other manipulations.